Screen printing is the process of transferring artwork onto textiles using mesh screens (as a stencil) and a squeegee to apply the ink. A screen is created for each color that needs to be printed. Screens are placed in a press in the proper print order. They must be registered (or lined up) to ensure that all of the colors print correctly together. Once the graphic is registered, the screens are filled with ink. The inks are then pushed through the screens with a squeegee, one color at a time, onto the garment. 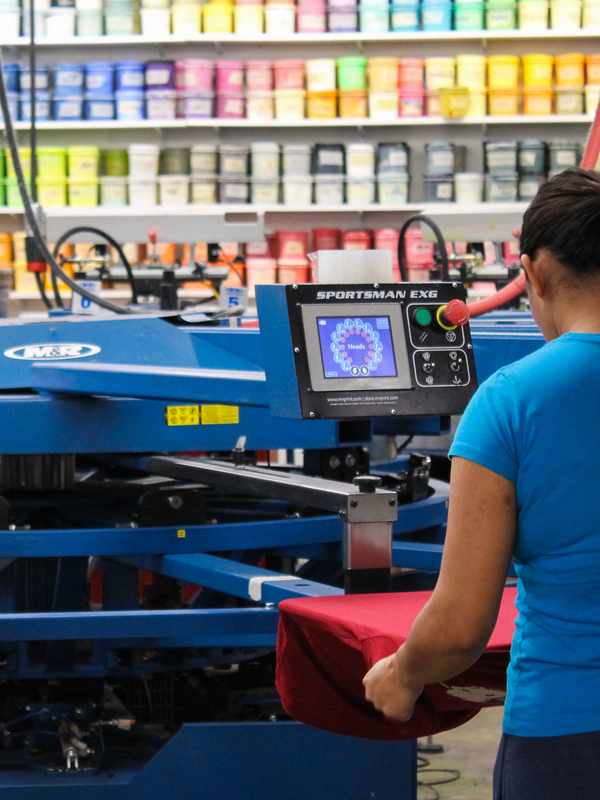 When all colors are printed, the garments are run through a large dryer (usually set above 300 degrees) to cure the inks. Will you create a design for my project? Many customers provide us with high resolution graphics. The best screen print results are obtained using a high res file that is 600 dpi at the actual desired print size. If you don't have the resources to provide a graphic file, we can help develop your "napkin sketch" into a high res art file. An estimate of lead time and billable hours will be provided once your project is reviewed. A high end screen printing ink made for use on 100% cotton garments. Water based inks dye the filaments of the garment. As the inks may be influenced by the pigment color of the garment, it is recommended for use on lighter colors (i.e. white, natural, ash, stone). Dark colored garments require a base layer of ink to mask the pigment in the garment. Without the base layer, the actual garment color can bleed through the ink and cause the ink to look dull or change color. The underbase is printed and flashed dried, prior to screen printing the ink colors. It is the underbase that allows the true, vibrant colors to print nicely. All orders start with a review of project, art files and garments to be embellished. Once the particulars are determined, the customer provides a detailed listing of the order by garment size, color and quantity. A Work Production sheet that details the order and a price quote are provided to the customer. Upon approval of the Work Production Sheet and receipt of the deposit, products are ordered and production time is scheduled. Final payment is made when the order is picked up or shipped. Can I mix garments to meet minimum orders? Yes, short and long sleeve tees or garments that are embellished in the same location, with the same ink colors, and at the same print size may be combined. Yes, as long as the print colors and graphics are the same. Generally we do not accept customer provided garments. Do you stock blank shirts? The wide variety of products, different styles and colors offered on the market today do not make it feasible for us to stock blanks. We order products only to fulfill your order. Due to incidentals out of our control, ie., hole in shirt, ripped seam, etc, we suggest that you order a few extra pieces over and above the exact quantity needed. We can consult with you about a recommended amount. Is there a certain format that the art file needs to be in? Yes, PSD, EPS or PDF high resolution files are required. A resolution of 600 dpi at actual print size is preferred. The normal turn around time for an order is 5-7 business days from time of approval. This may change in peak season.